The Best Scooters For Kids Site! When most of us think of kids scooters, we think of the modern aluminum frame design with tiny wheels, such as scooters manufactured by Razor or Mini Micro. However, there was a whole century of scooters before the ubiquitous metal kick scooter with varying designs and styles. Many of them were little more than wheeled dollies attached to a box with a stick through it, but they were scooters none the less. Not long before the aluminum scooter era, there were the Kent Super Scooters, which look and acts far more like a traditional bicycle than a kids kick scooter. 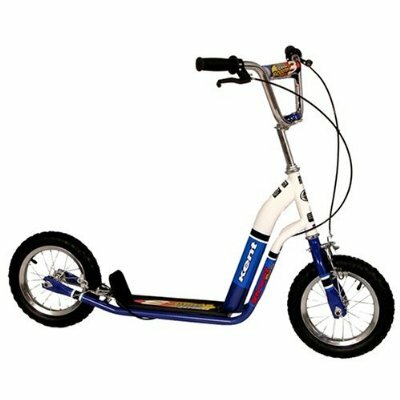 It has a very sturdy steel tube frame, yet weighs only 18 pounds. Kent has been in the bicycle business for close to 100 years, and they put their heads together and came up with a scooter that is stable and easy to ride. The Kent Scooter sports big mountain bike type knobby scooter tires, and traditional bike wire handlebar braking system. You can get it in either 12″ or 14″ tires depending on the size of the kid riding the scooter. 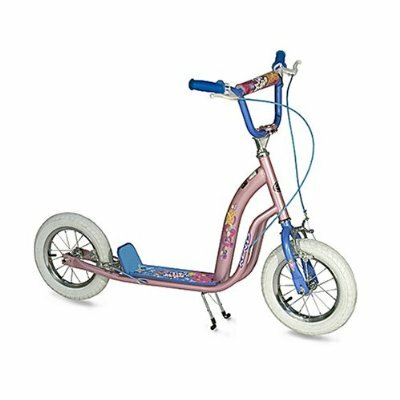 The suggestion is that kids 8-111 use the 12″ tires and kids 11+ and adults use the 14″ version, although there really is not a large functional difference, just more proportional for a larger person. There is no weight limit on the Kent Super Scooter that we could find, and there is precious little information on the Kent website either. Since the description states that the Kent Scooter is designed for adults as well as kids, we’d put the weight limit on this at 200-225 pounds max. Since this traditional scooter is far more like a bicycle, it makes a great stepping stone for the child who had an accident while learning to ride a bike and now refuses to get back on and try again. Since the motion and balance is very similar, learning to use the Kent Super Scooter can give them the confidence they need to get back on that horse again. Kent Scooters are built like a bicycle on purpose to make it a more solid vehicle. If you are looking for a scooter that is designed more for actual travel with a smooth ride and an ability to take bumps that a regular small wheel style Razor type scooter cannot, the Kent Super Scooter is certainly the scooter for you. If you are looking for a freestyle trick type scooter, stick with the Razor models. Note that the Kent Scooter is also available in different color styles, including one that is black with red details, a purple version, as well as this pink version for the girl scooter look. Click here for more details and pricing on the Kent Super Scooter line. the weight limit is 100 it said in the instruction manual but i don’t think it’s true. Previous post: Razor Spark DLX Scooter – How Is It Different From The Razor Spark? Electric Scooters For Kids? How Old Should They Be? Razor S Scooter Comparison – Special Edition? Razor Spark DLX Scooter – How Is It Different From The Razor Spark?